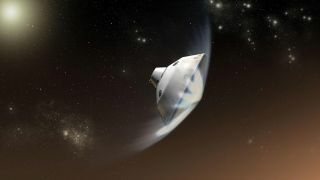 This artist's concept depicts the entry of NASA's Curiosity rover through Mars' upper atmosphere. The Mars 2020 mission will use aspects of this design for its project. The heat shield for NASA's upcoming Mars rover suffered a fracture during testing recently, but the incident won't change the mission's launch date, agency officials said. The Mars 2020 mission is designed to search the Red Planet's surface for signs of ancient microbial life, and the six-wheeled robot will also hunt for and characterize potentially habitable environments. The mission is scheduled to launch in 2020, when Earth and Mars are properly aligned for an interplanetary mission, and arrive at the Red Planet in early 2021. The Mars 2020 team found the fracture on April 12. Mission management at NASA's Jet Propulsion Laboratory in Pasadena, California, will work with Lockheed Martin to lead an examination of the cause of the crack and to decide if any design changes should be made, NASA officials said in the statement. The incident won't delay the Mars 2020 launch, though, which is currently targeted for July 17, 2020, the officials added. It's important to investigate this crack, because the heat shield is part of the spacecraft's thermal protection system, designed by engineers to keep the Martian rover safe as the vehicle experiences intense heat during atmospheric entry. NASA officials said the current heat shield will be repaired to permit continued prelaunch spacecraft testing. The Mars 2020 mission team will develop a new heat shield structure over the next year, and once that's completed, the new shield will receive other important components like thermal protection tiles. Follow Doris Elin Salazar on Twitter@salazar_elin. Follow us@Spacedotcom,Facebook and Google+. Original article on Space.com.